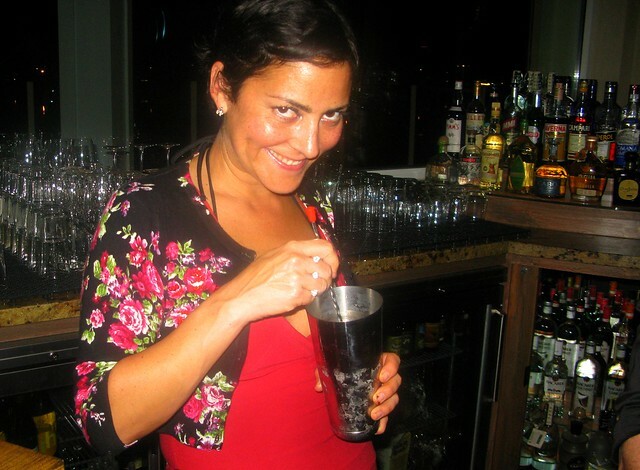 Jolie Klein, one of the four bartenders responsible for the cocktail menu at the new Vu Restaurant in Marina del Rey, seems to have the deck stacked against her: 1) Unlike a lot of L.A.’s renowned bartenders who can claim training under New York’s elite mixologists, she’s self taught; 2) she doesn’t have much on her resume, a couple of months at Tasting Kitchen where she helped with the bar menu, among the listings; and 3) the bar she works in is located in an MDR hotel with the not-great name, Jamaica Bay Inn. And yet her cocktails, at least the ones I tasted during a hosted dinner last week, compel me to come back as they are unique. But maybe that could be attributed to the very things that stack that deck, in that she’s coming from somewhere new. 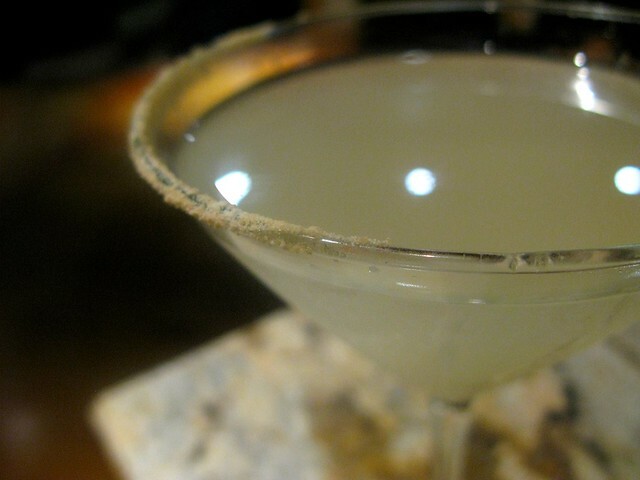 Guestacy: Asian pear with Hendrick’s Gin and Dimmi with honey powder. “Guestacy,” a combo of words “guest” and “ecstacy,” is Vu’s term for “Bartender’s Choice.” Yeah, kinda cheesy but this drink did make my eyelashes flutter. This cocktail was honeyed but not too sweet and its rim lightly dusted with an expensive honey powder which boosts this price to $20. It’s a perfect way to start off the evening — light, clean and luxurious. I could totally imagine a CK commercial about it. Cue Gabriel Aubry picking it up off a pedestal. White Manhattan: Death’s Door White Whiskey, Luxardo maraschino liqueur and The Bitter Truth Jerry Thomas? Own Decanter Bitters. If anything epitomizes what Jolie is doing with cocktails it is this one. 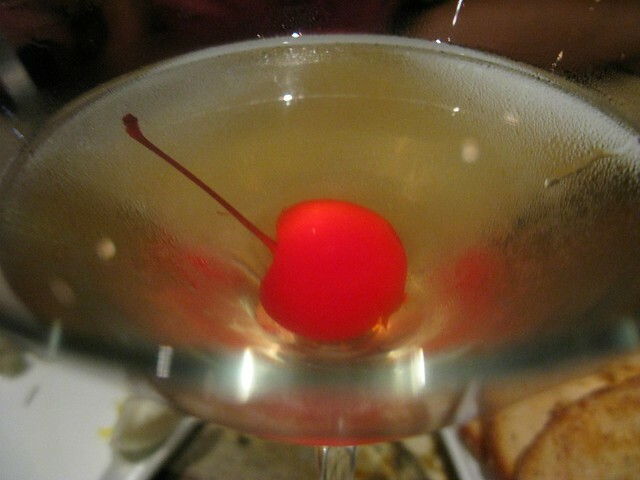 A classic possessing the same complexity and potency of my favorite cocktail but minus the familiar hue. For some reason she calls it a Manhattan on Crack, but I call it right up my alley, just as long as no one mistakes it for a ‘tini. 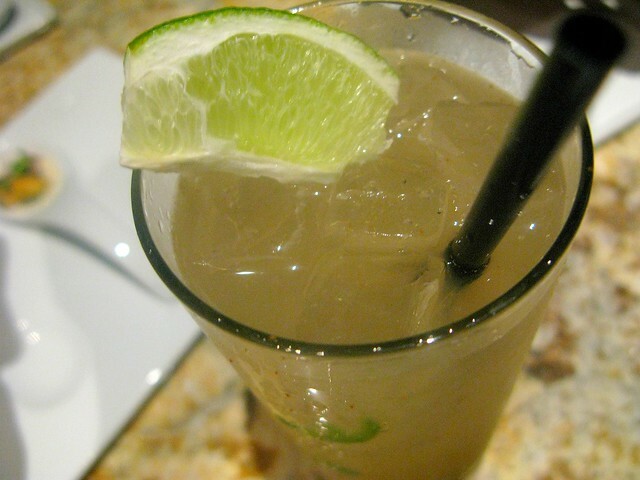 Spicy Hunter: Tapatio, jalapeno, agave nectar, fresh-squeezed lime juice, Cazadores Reposado. A margarita with a lot of kick that pairs nicely with basically anything. The spiciness of the cocktail makes you just want to drink more and soothe the burn. 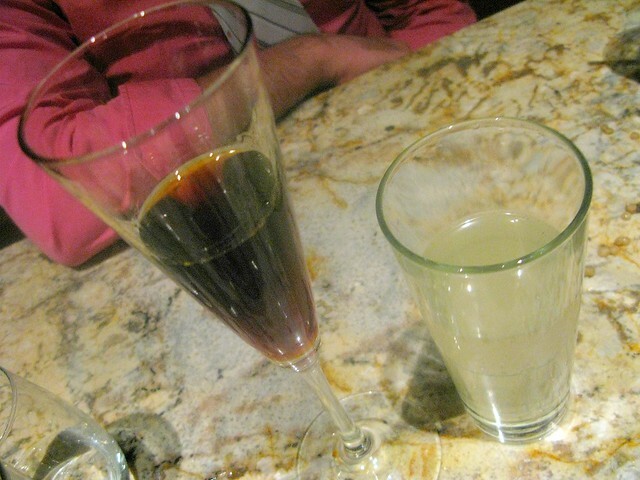 Beer After Branca: Fernet Branca, Canton liqueur and Averna with a ginger beer back. Fans of Fernet will be familiar with this mix where you sip the Branca first and follow it with a ginger ale chaser. Here, Jolie adds a little sumthin-sumthin by swirling the glass first with Averna and then pouring an ounce of Fernet Branca with Canton. Personally, I think it would be fine without the Canton since you already have the ginger beer, but it doesn’t hurt it. This would be interesting to have with my instant Vu favorite, the pork belly with root beer jello over fried grits. Mmmmm! Tastes like chicken and waffles. However, the only problem with Jolie’s cocktails, at least for now, is that apparently she’s the one who makes them the best at Vu Restaurant. Fortunately, she’s currently schooling the other bartenders, each who also have their own cocktails on the drink list. But if you don’t want to take any chances with anyone else, she’s at the bar Wednesday and Thursday during the day and Friday, Saturday and Sunday at night. Happy Hour: Monday thru Friday, 4-7 pm; Reverse Happy Hour/Service Industry Night Sunday nites, 8 pm-close — $6 cocktails and wines, $4 tap and $5 small plates. It was actually pretty tasty. If you like chicken and waffles you’ll love it. Great blog!The photos are nice. You have introduced a different taste.I like it very much. 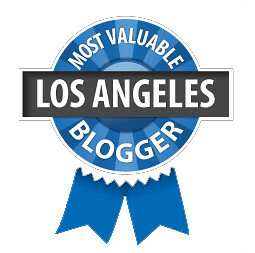 Actually this is a very different blog. I would like to give you a huge thumbs up!